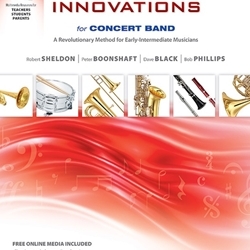 Sound Innovations for Concert Band, Book 2 continues your student's musical journey by teaching with a complete review of Book 1, and a segmented presentation of new concepts while introducing ensemble playing. Following the unique Sound Innovations organization, the band method contains levels, each of which is divided into several sections that introduces concepts separately, providing benchmarks, assessment, and intermediate goals. The isolation of new concepts helps facilitate the understanding of more advanced material. Sound Advice sections throughout the Teacher’s Score assist with quick and easy-to-use tips and suggestions. Plenty of practice and performance opportunities are also provided in order to reinforce each lesson. MasterClass lessons with woodwind and brass ensemble videos and accompaniment recordings are available streaming at www.alfred.com/SIOnline from anywhere with internet access. Learn more at www.alfred.com/SIOnline. "Sound Innovations by Alfred Music is a dream-come-true method for beginning concert band and string orchestra. Its infusion of technology provides an open-ended architecture of the first order. This unique blend of time-tested strategies and technology offer a great foundation for a successful learning experience."